When your cruise ship docks at the Port of Los Angeles in San Pedro, hop in a taxi and drive 10 minutes to the Battleship Iowa Museum, located on the San Pedro waterfront. 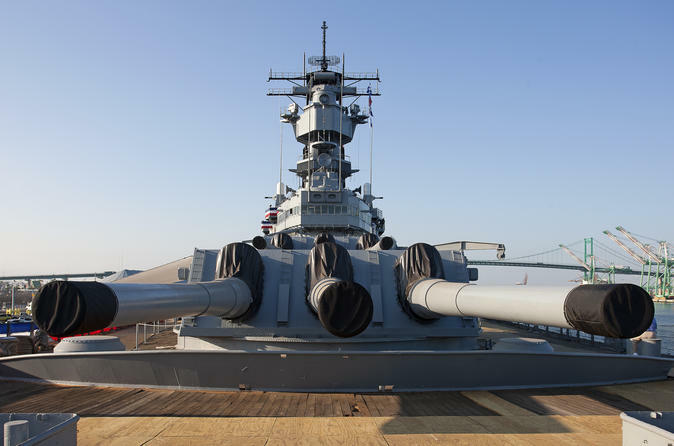 The Battleship Iowa served the US for more than 50 years and is touted as the World’s Greatest Naval Ship due to its big guns, heavy armor, speed, longevity and modern technology. It is the last lead ship of any class of US battleships and was the only ship of its class that served in the Atlantic Ocean during World War II. As you walk along the wooden decks of the battleship, you’ll see what life must have been like for a sailor during World War II, the Korean War or the Cold War. Visit ammunition areas, missile decks, bridges and the captain’s cabin, and explore educational and interactive exhibits such as a virtual aerial combat game in the ship’s below-deck theater. You’ll also learn some important maritime history, including the interesting fact that no other battleship in America’s history has hosted more US presidents, including Franklin Delano Roosevelt, Ronald Reagan and George H W Bush. After your time here, hop in a taxi and head back to the port to board your cruise. This excursion is located within a 10-minute drive to the cruise port, so you determine the time you return to your ship in Los Angeles. Please allow yourself ample time to enjoy the excursion and ensure your timely return to the port. This excursion is not covered by our worry-free policy.